July has been insane! An extremely happy month due to traveling to see Holly get married, but we moved as well. Moving with a 3 year-old is not conducive to reading time. So my stack of To-Reads is growing every day. Combined with my compulsion to grab at least one extra book every time I walk into the Chicago Public Library-I need to get some books out of my house and off my To-Read List. Thankfully, Octavia at Read, Sleep, Repeat came up with ARC August as a challenge to get through some books and I’m joining in! And the other 3 I’ll decide on when I get there! Anyone else doing ARC August? What are you reading? This book makes me think of a bowl of vanilla ice cream. Wonderful and just right for some, but also too plain for others. For me The Art of Arranging Flowers was vanilla ice cream that needed a lot of toppings. I was excited to learn about Ruby and intrigued by her floral skills. Ruby knows the right flowers for every occasion and knows what secrets to add to help a budding romance or ease a cancer patient’s pain. That’s a pretty cool talent for a florist! I wanted to know more about it. I just wanted MORE from this book in general. It was a little too simple and sweet for me -I think I was looking for some angst or action. The Art of Arranging Flowers delves into grief, love and how family and friends can heal us all while describing some beautiful bouquets. There is definitely a reader that will love The Art of Arranging Flowers, sadly it just wasn’t me. I liked it fine, but I just could not love it. You might love it though-lots of readers on goodreads are! Anyone else read this one and disagree with me? Thank you Penguin and NetGalley for this advance read copy in exchange for an honest review. Holly here – I am totally hijacking the blog because Amanda is out of town for a few days. – because she is at my house this weekend! – because J & I are getting married tomorrow! If I were a bit more together, I would put together a post about how spending evenings sitting in the family room while J (in his recliner) and I (on the couch, with a cup of tea) are both reading, is among my favorite things to do. 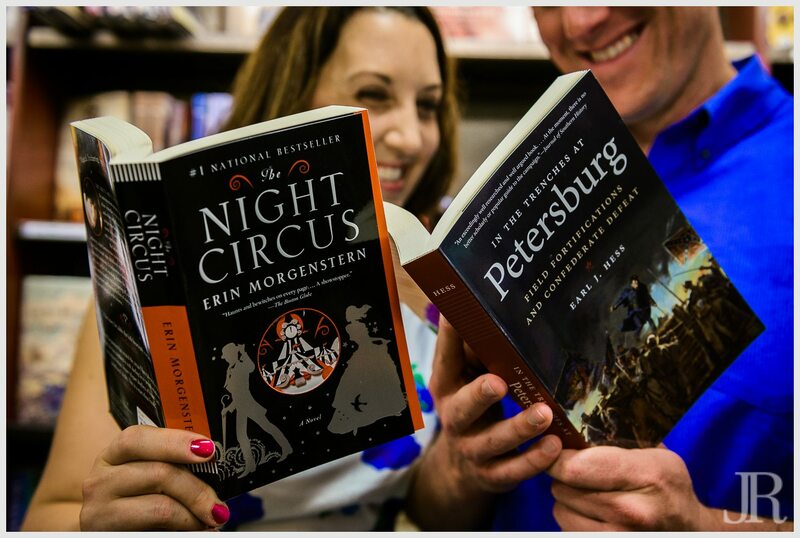 However, I’m a little busy this week, so instead, I offer you photographic representation of our life in books: I am reading a book that Amanda demanded I read and Jeff is reading about the civil war. Typical evening (save the fancy dress and professional photographer). I can’t talk about this book without talking about my experience with Eat, Pray, Love – and that is this: I really loved Eat, Pray, Love. And then I read a whole bunch of negative comments on the book, complaining that Elizabeth Gilbert was narcissistic and spoiled and that it was incredibly unfair that she got to go on this sojourn around the world while processing her first world problems. Even my mom called her a whiner. Whatevs – I dug it. And then The Signature of All Things came out, and all I’ve heard about this book is great praise – which sort of left me wondering, would I have the opposite reaction as the critics this time, and hate this book? So, I picked this up (from the library, yo!) with some trepidation. And – I loved it. I wanted to start recommending it to people before I was even done. 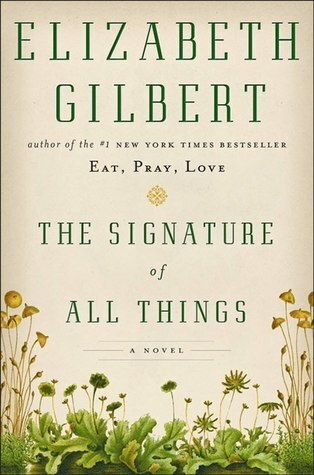 The Signature of All Things is set in the nineteenth century, in Philadelphia and (way) beyond.. It starts with the story of Henry Whittaker, who grew up poor in England and then rises to great fortune through a combination of hard work, moxy, and circumstance, and then turns to his daughter Alma, born in 1800. The story of the family runs alongside the story of nineteenth-century scientific progress, with a heavy dose of repressed desire throughout. The 500 pages ebb and flow, with times where a great deal of action happens in quick succession, followed by times where nothing seems to happen for years on end. It’s a long book – and drags on a bit at the end – but it did not take me long to finish. In summary, highly flawed characters + weird and random adventures + interesting scientific details make for an enjoyable read. Throw in broader themes about abolition, colonialism, and what families are made of, and I found parts of this story sticking with me. And, if nothing else, you’ll learn Victorian slang for ladyparts, as well as some facts about plants. Beatrix admired the useful over the vapid, the edifying over the entertaining. She was suspicious of anything one might call “an innocent amusement,” and quite detested anything foolish or vile. Foolish and vile things included: public houses; rouged women; election days (one could always expect mobs); the eating of ice cream; the visiting of ice cream houses; Anglicans (whom she felt to be Catholics in disguise, and whose religion, she submitted, stood at odds with both morality and common sense); tea (good Dutch women drank only coffee); people who drove their sleighs in wintertime without bells upon their horses (you couldn’t hear them coming up behind you! ); inexpensive household help (a troublesome bargain); people who paid their servants in rum instead of money (thus contributing to public drunkenness); people who came up to you with their troubles but then refused to listen to sound advice; New Year’s Eve celebrations (the new year will arrive one way or another, regardless of all that bell-ringing); the aristocracy (nobility should be based upon conduct, not upon inheritance); and overpraised children (good behavior should be expected, not rewarded). Today we’re hooking up with the Broke and the Bookish for their Top Ten Tuesday and here are my top ten characters I would want with me on a deserted island. 4. Lula of the Stephanie Plum Series. Because she makes me laugh until I cry in almost every book. 5. Ranger also Stephanie Plum. Because he’d get us out of any situation-also he’s just hot. 6. Miss Havisham-of the Thursday Next Series specifically. Because if we need to get out she can always read something to get into the Book World. Also, she’s hilarious. 7. Percy Jackson-definitely stole this from another TTT list at Book Revels because she made a really good point-if you’re stuck on an island you want the son of the sea god on your side! 8. Celaena Sardothien from Throne of Glass. I feel like having a female assassin on board can’t hurt anything. 9. Verity Price from Incryptid. Who knows what kind of island this is-we may need a scientist. 10. Elisa from the Girl of Fire and Thorns. She’s got serious camping experience so I think she’d be good to have around! Amanda: Wow. So I think I can safely say Holly and I agree, Dorothy really has to go. She’s a megalomaniac in blue gingham and red heels. Happily my fears were unfounded! This book ended with a quite a kick and set the stage well for book #2. Holly- Yes! I had the same thoughts about the cover. What I really liked is that no one is really completely trustworthy. Amy has to be a smarty pants. Its going to boil down to Kansas girl vs. Kansas girl. Wizard, Order of the Wicked, monkeys, Pete. Who to trust?! In summary, this was a book that did not make me work very hard, but still had some heavy topics woven in about fear and power. I wasn’t kidding about the Nazi references! And because it was such a clever and creative idea, and because I’m currently sending this text from Kansas I give it 5 stars! I can’t wait for #2! I completely loved this book for the creativity. I think Paige was very brave to take this beloved story and basically turn it on its head. I really liked Amy and even her pet rat. I cannot wait to see what happens next and I think I’m going to brush up on my Baum reading to get ready. I might even check out the novellas set in Paige’s Oz. I have to go down a 1/2 star because of the romance. It was not believable enough for me, but we’ll see what develops in Book #2! I’m hoping for more munchkins! Head down the Yellow Brick Road and tell us what you think! Thank you Harper360 for these copies in exchange for an honest review!! Imagine for me if you will that a teenaged Paris Hilton killed her mother. Imagine the fall out, the paparazzi and the E! news hysterics. Then imagine after her conviction Paris is released from jail 10 years later on a technicality. That is the basic premise behind Dear Daughter. Janie Jenkins went from tabloid darling to inmate. She’s now hiding from the paparazzi and trying to re-acclimate to freedom after 10 years in jail. Janie was not a nice character, but she was a fun one! I loved her attitude and the situations her mouth got her into. It wasn’t hard to see why people believed she was a murderer! Janie really doesn’t think she is the one that killed her mother, but she’s not absolutely sure. Going on snippets overheard before her last fight with her mother on the night of the murder Janie is out to investigate who her mother really was. With the help of her attorney she changes her appearance and flees California. Jane ends up undercover in small-town South Dakota where she sticks her nose into everything and everyone’s business trying to find out why her mom would have mentioned this town. She doesn’t necessarily make herself more likeable, but she was entertaining! Jane’s story is interspersed with transcripts from her police interview, news articles and posts from a true crime blogger who has a price on her head. I liked getting all the flashes back at the past drama Jane was involved in right along with her current snooping. While I found that the motivation for the murder was easy to predict, the path we took the revelation was not what I thought it would be. I was definitely on edge at the end of this book waiting for a reveal. I had to get off the train with 4% left on my kindle and that nagged at me all day. The wait was totally worth it. The conclusion was more than I expected and the ending of this book made me really laugh out loud. It was the perfect wrap up to Janie’s story. I felt like Jane’s mom tried to steal the story from beyond the grave-but Janie wrenched right back for herself. I can see why this is being compared to Gone Girl, but I enjoyed it much more. Janie was not always likeable, but you still want to root for her! This is Little’s debut book and I am definitely looking forward to more. Read it and tell me what you think! Thank you Viking and NetGalley for this advance copy in exchange for an honest review.